Big Manawatu sprinter Simon Van Velthooven showed real maturity in his young career with a superb victory in keirin on the third night of finals in Invercargill tonight. The 22-year-old produced a massive effort in the final thrust at the line to edge out Australian champion Scott Sunderland. It was van Velthooven’s third gold medal this week after national records in winning the team sprint and 1000m time trial. Van Velthooven has been the fourth rider among the burgeoning sprint group but his performances have forced him into real consideration for next year’s London Olympics. “This year I did not go to Japan to race in the professional series and that was a good thing,” Van Velthooven said. “It allowed me to train in Europe with the guys, then race in the US and come back and really prepare well. “I knew if I got behind Sunderland I would get boxed in and not get over him. But I just held there for two laps on his wheel. I lost some ground in the corners but made it up in the straights. I knew with my kilo performance that I could hang in there. Sunderland finished second with compatriot Peter Lewis third with the other kiwi Eddie Dawkins unable to get clear air. Earlier world silver medallist Shane Archbold showed speed and skill to claim the lead after three events of the men’s omnium at the ILT Velodrome. Archbald (Timaru) produced a personal best to win the Flying Lap and disappointed for fifth in the Points race earlier in the day, before bouncing back to win the Elimination race with an assured display. After three races he leads on seven points with fellow kiwis Cameron Karwowski and veteran Jason Allen sharing second on 12 points, Westley Gough on 13 and the leading Australian Edward Bissaker on 14. Canterbury professional Joanne Kiesanowski proved her super-consistent self with three second placings to be second overall on six points, sandwiched one point behind Amy Cure and two ahead of her Australian teammate Ashlee Ankudinoff. Kiesanowski produced a personal best to finish behind world champion pursuiter Ankudinoff in the Flying Lap, with the kiwis’ 14.795 a personal best. Cure dominated the points race, getting away in a break to put a lap on the field mid-race which set her up for the win, but Kiesanowski showed so much nous to finish second. Again Kiesanowski was classy throughout the Elimination but the explosive Cure held her off in the final sprint for the win. The men’s under-19 New Zealand combination of Hayden McCormick, Tom Beadle, Kristoff Ford and Dylan Kennett smashed the national record in winning their 4000m final over Australia, clocking 4:11.339. The young kiwi rider came back to win the under-19 10km scratch race when he held out the world junior omnium champion Caleb Ewan by 5/1000th of a second on the photo finish. It capped a great week for Kennett, with the Waimate teenager picking up four gold medal, with three of then won in national records. The evening was completed with a superb men’s 30km points race, won brilliantly in the final sprint by Southland star Tom Scully. The Garmin development team professional edged out New Zealand representative Aaron Gate in the last sprint of the night to finish one point clear. The championships conclude tomorrow with the completion of the omnium competition and sprints for men and women. 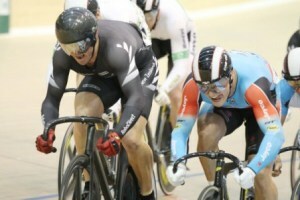 Omnium, Flying Lap: Shane Archbold (NZL) 13.192, 1; Cameron Karwowski (NZL) 13.289, 2; Westley Gough (NZL) 13.349, 3. Points race, 30km: Marc Ryan (NZL) 43 points, 1; Jason Allen (NZL) 32, 2; Gough 31, 3. Elimination: Shane Archbold (NZL0 1, Cameron Karwowski (NZL) 2, Jason Allen (NZL) 3. Points after three rounds: Archbold 7, Karwowski and Allen 12, Gough 13, Edward Bissaker (AUS) 14, Myron Simpson (NZL) 17, Marc Ryan (NZL) 18, Scott Law (AUS) 21, Andrew van der Heyden (Mid South Canterbury) 27, Regan Sheath (Southland) 28. Keirin, semifinals1: Simon Van Velthooven (NZL) 1, Andrew Taylor (AUS) 2, Dan Ellis (AUS) 3. Semifinal 2: Eddie Dawkins (NZL) 1, Peter Lewis (AUS) 2, Scott Sunderland (AUS) 3. Final: Van Velthooven 1, Sunderland 2, Lewis 3, Andrew Taylor (AUS) 4, Dan Ellis (AUS) 5, Eddie Dawkins (NZL) 6. 30km Points Race: Tom Scully (Southland) 49 points, 1; Aaron Gate (NZL) 48, 2; Sam Bewley (NZL) 18, 3. Under-19 Sprint, qualifying: Alex Radzikiewicz (AUS) 10.984, 1; Daniel Ellison (NZL) 11.084, 2; Zac Williams (NZL) 11.188, 3. Quarterfinal: Bryan Clemen (FRA) BT Williams, Mat Beazley bt Harrison Perriam (NZL), Radzikiewicz bye, Ellison bye. Semifinals: Radzikiewicz bt Beazley 2-0, Clemen bt Ellison 2-0. Third-fouth: Ellison bt Beazley 2-1. Final: Radzikiewicz bt Clemen 2-1. 4000m team pursuit, qualifying: New Zealand 1 (Hayden McCormick, Tom Beadle, Kristoff Ford, Dylan Kennett) 4:17.770, 1; Australia (Caleb Ewan, Tirian McManus, Reece Robinson, Jack McCulloch) 4:23.489, 2; New Zealand 2 (Alex Hooper, Hamish Schreurs, Mathew Zenovich, Tayla Harrison) 4:29.231, 3. Final: NZL 4:11.339, 1; Australia caught, 2. Scratch race, 10km: Dylan Kennett (NZL) 1, Caleb Ewan (AUS) 2, Hamish Schreurs (NZL) 3. Omnium, Flying Lap: Ashlee Ankudinoff (AUS) 14.423, 1; Joanne Kiesanowski (NZL) 14.795, 2; Amy Cure (AUS) 14.958, 3. Points race, 20km: Cure 35 points, 1; Kiesanowski 20, 2; Ankudinoff 18, 3. Elimination: Cure 1, Kiesanowski 2, Sequoia Cooper (NZL) 3. Points after three rounds: Cure 5, Kiesanowski 6, Ankudinoff 8, Kate Bates (AUS) and Cooper 16, Liz Steel (Canterbury) and Racquel (NZL) 20, Alex Neems (NZL) 21, Brie Dutton (AUS) 30, Kathryn Jones (Otago) and Hannah Latta (Wellington) 32. Under-19 Sprint, qualifying: Paige Paterson (NZL) 12.033, 1; Tenille Falappi (AUS) 12.216, 2; Alle Proud (AUS) 12.224, 3. Quarterfinals: Falappi bt Imogen Hones (AUS), Proud bt Victoria Steel (NZL), Rebecca Dunn (AUS) t Kate Dunlevey (NZL), Paterson bye. Semifinals: Paterson bt Dunn 2-0, Proud bt Falappi 2-1. Third-fourth: Falappi bt Dunn 2-0. Final: Paterson bt Proud 2-0.